Are you looking to gain insights, drive innovation, securely unlock assets and expand existing & grow new revenue channels? Let us show you how IBM API Connect can help you succeed using a workshop or a POC. 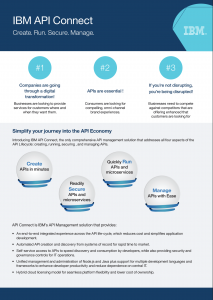 As an IBM Premier Business Partner, Openlogix can help you create, run, manage and secure your end to end API Ecosystem. Tell us more about your API project or your IBM API Connect needs and one of experts will get back to you in 24 hours. Join Openlogix for this 45-minute webinar that will give you an overview of IBM API Connect, a short Demo, and finish up with a few case studies of how API is being leveraged at other companies to Gain Insights, Drive Innovation, Securely Unlock Assets and/or Expand Revenue Channels. 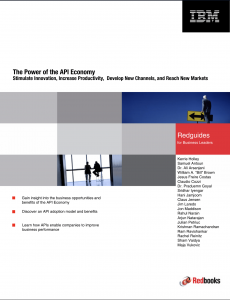 Openlogix can help you maximize what API Connect offers. API Connect has various deployment and pricing options. Free Starter API solution. Get Started right away. 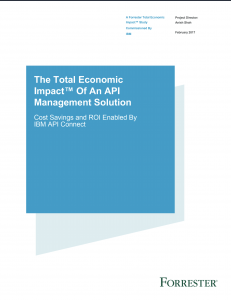 An enterprise-grade API solution - pay as you grow. Share your API calls between Cloud and your On-Prem. Go directly to Cloud Foundry or OpenWhisk to try it out. Openlogix can help you understand the deployment options, capacity planning, & sizing. Ready for an API Connect Workshop, POC or Demo? To learn how you can deploy new products and services faster, with improved operational efficiency and profitability, schedule a Proof-Of-Concept/Pilot with a few of your applications to establish the business ROI, and see for yourself. We get these questions all the time. If you have any other questions, please feel to reach out. What features are included with IBM API Connect Professional? What features are included with IBM API Connect Enterprise? What are the basic connectors? How can I find out if IBM API Connect is the right tool for my organization? Sign up with us for a complimentary one-hour consultation to get started in the application programming interface economy.